Foundress, and first superior-general of the Congregation of the Sisters of Notre Dame of Namur, born 12 July, 1751, at Cuvilly, a village of Picardy, in the Diocese of Beauvais and the Department of Oise, France; died 8 April, 1816, at the motherhouse of her institute, Namur, Belgium. She was the sixth of seven children of Jean-François Billiart and his wife, Marie-Louise-Antoinette Debraine. The childhood of Julie was remarkable; at the age of seven, she knew the catechism by heart, and used to gather her little companions around her to hear them recite it and to explain it to them. Her education was confined to the rudiments obtained at the village school which was kept by her uncle, Thibault Guilbert. In spiritual things her progress was so rapid that the parish priest, M. Dangicourt, allowed her to make her First Communion and to be confirmed at the age of nine years. At this time she made a vow of chastity. Misfortunes overtook the Billiart family when Julie was sixteen, and she gave herself generously to the aid of her parents, working in the fields with the reapers. She was held in such high esteem for her virtue and piety as to be commonly called, "the saint of Cuvilly". When twenty-two years old, a nervous shock, occasioned by a pistol-shot fired at her father by some unknown enemy, brought on a paralysis of the lower limbs, which in a few years confined her to her bed a helpless cripple, and thus she remained for twenty-two years. 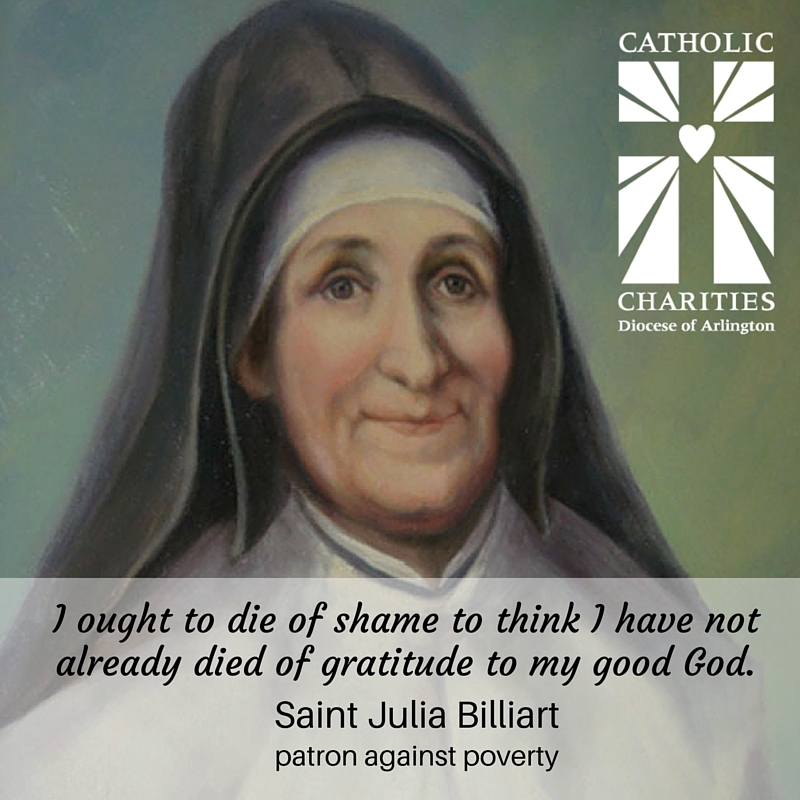 During this time, when she received Holy Communion daily, Julie exercised an uncommon gift of prayer, spending four or five hours a day in contemplation. The rest of her time was occupied in making linens and laces for the alter and in catechizing the village children whom she gathered around her bed, giving special attention to those who were preparing for their First Communion. St. Julie's predominating trait in the spiritual order was her ardent charity, springing from a lively faith and manifesting itself in her thirst for suffering and her zeal for souls. Her whole soul was echoed in the simple and naove formula which was continually on her lips and pen: "Oh, qu'il est bon, le bon Dieu" (How good God is). She possessed all the qualities of a perfect superior, and inspired her subjects with filial confidence and tender affection.